Gift Bags, Keychains, Novelties & More. Sports parties. Luau parties. Pirate or Princess parties for kids. If you’re planning a theme party, you already have an idea as to how and what you want to do in order to pull it off. But, what to do for parties without a specific theme? Parties for no good reason other than just for the fun of it? Or, maybe your party plan is so unique and so specific, it simply defies classification. No worries. 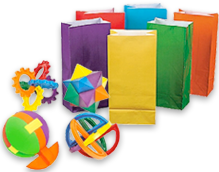 1SuperParty specializes in party supplies, party decor, party favors, and everything you need to throw any kind of blowout for and kind of audience! Shop 1SuperParty for all of your party planning needs including supplies, decor, party favors, gifts, and more.